Happy Monday! I hope you had a wonderful weekend! We got our first taste of wintry weather and I loved watching the snow fall! In North Carolina, we don't get a ton of snow but I love it when we do. We spent our weekend enjoying lots of family time and too much good food, as usual. 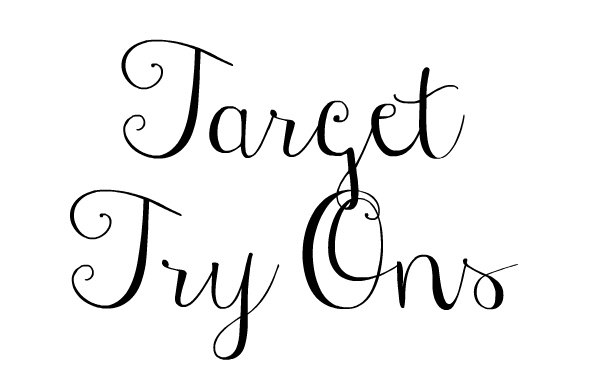 Today, I'm sharing my latest try on session and because of your votes on Instagram Stories, I'm sharing another round of finds from Target! I found so many pretty things this time and it was honestly really hard to only walk away with a couple of items (can you guess what I bought?!). But y'all are in luck because almost everything I tried on is currently on sale. Woo hoo! 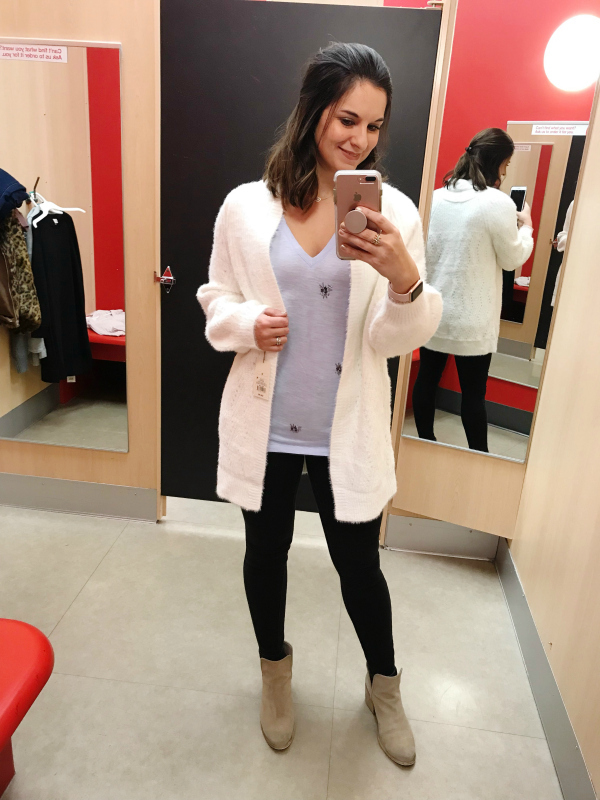 This gorgeous cream cardigan is so incredibly soft and cozy! The pictures of it just do not do it justice. I tried on a medium and I absolutely loved the fit. If I didn't already own a long cream cardigan, I would have definitely taken this one home with me. I loved it so much! This beautiful embellished tee is super budget friendly (it's only $8 or 2 for $12)! I love the pretty jeweled details. I am also wearing a size medium in this one because I prefer a looser fit for my tees. 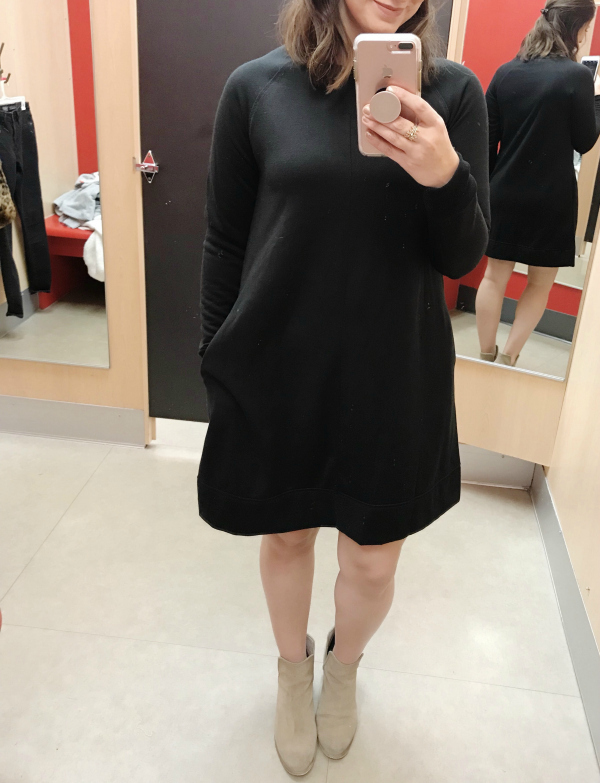 This is a sweatshirt that also happens to be a swing dress with pockets! 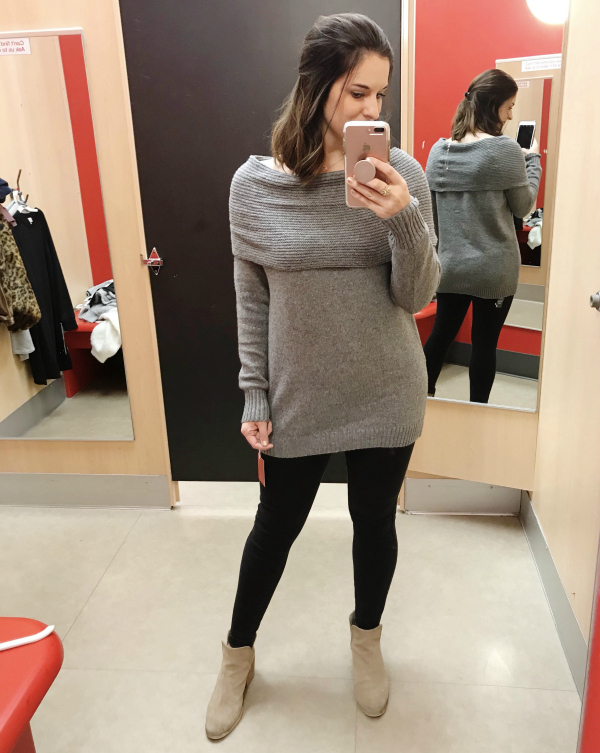 What more could you want in a comfortable dress for fall and winter?! This would be so cute layered with a vest and scarf. I would also wear this with over the knee boots for a dressier look or with sneakers for a casual style. 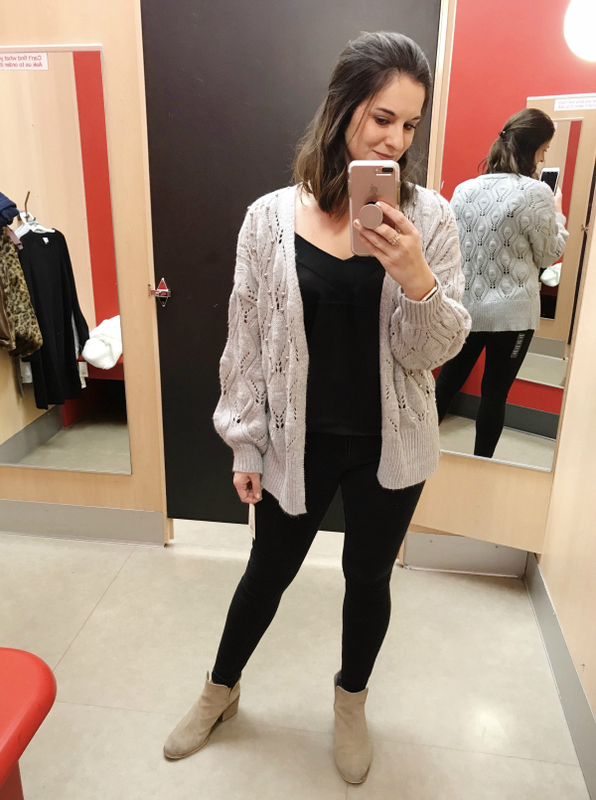 Such a cozy, versatile piece! This fits true to size and I'm wearing a size small. Like I've mentioned many times, I love a good gray sweatshirt. You just can't go wrong! I love the leggings friendly length of this one plus the cute cowl neck. This sweatshirt does run a little small so I would size up one size. I'm trying on a size medium. 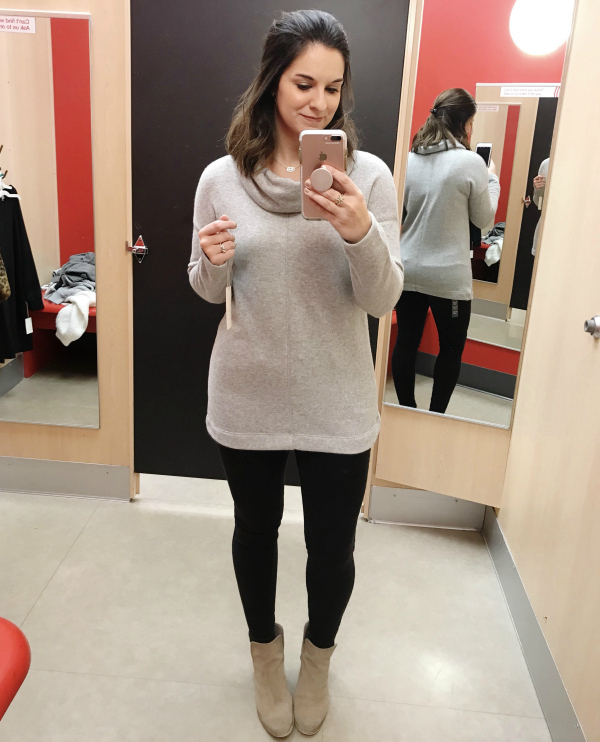 These black skinny jeans are high waisted and a mom must have! 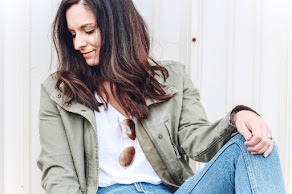 Such a great basic jean that you will get tons of wear out of. I'm trying a size four, regular length and they fit true to size. 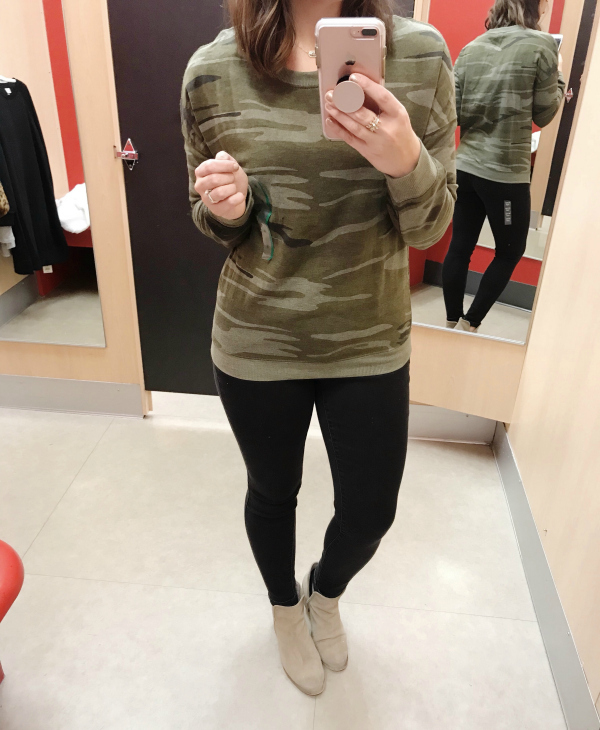 I have been seriously loving all things camo this season and this sweatshirt is no exception! This sweatshirt also runs small so I would size up. I'm wearing a size medium in this one. 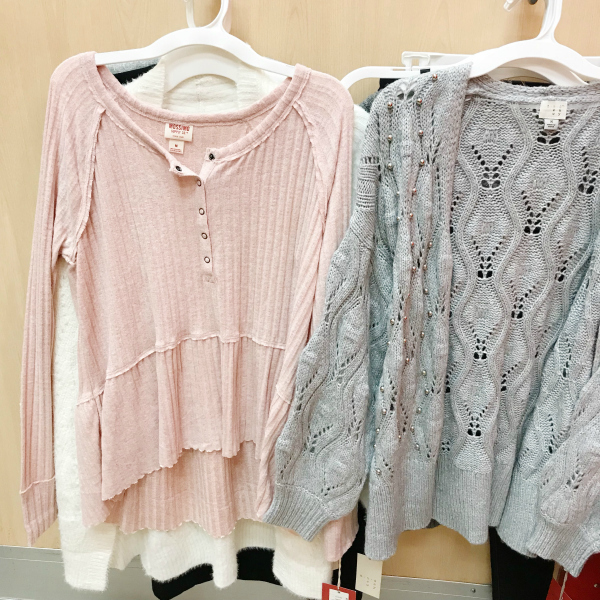 This is such a great off the shoulder sweater! I love the length and that it can be worn higher up on your shoulders as well. I loved this gray color but it also comes in blush as well! I tried on a medium in this sweater and I loved the fit. The small also fit but I liked the longer length of the medium better. This top was my favorite try on! It was one of those items that I randomly decided to try on (mostly because it was pink) and I ended up absolutely loving it. I love the henley style and the peplum hemline. I also love how it's slightly longer in the back. I tried this top on in a medium for get extra length and I loved the fit. It's also currently only $12 and a must have! I already own this embellished cardigan and I absolutely love the details. It's even prettier in person! It runs true to size but I sized up to a medium for an oversized look. I styled it with this satin cami and I love how they look together with the black denim. I tried the cami on in a size small and I found it to fit true to size. The cami also comes in a few other pretty colors, too!